This is a superb book for the dog trainer, breeder and general owner that wants to know exactly what is going on with the health of their dog/s and fully understand the diagnosis, the treatment and the recovery outlook. This is a presentation of the vet's eye view. There is detailed info here for students of the dog - vaccination, diseases - over 200 covered here- disorders - accident and first aid, breeding, behavior problems, and advice on treatments. Loads of illustrations too - over 140 clinical photos plus many diagrams throughout. 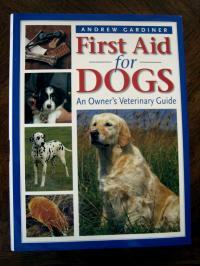 Also essential first aid techniques plus very helpful advice on nursing care for the sick canine. A must have for any dog owner - written by Andrew Gardiner - British vet - BVM&S, MRCVS, CERT SAS The info is presented in clear cut British style without unnecessary jargon but at the same time is very in depth in the study and detail of complex issues..common symptoms, what diagnostic tests to look for, likely costs for same, and outlook. Also covered homeopathic and alternative treatments as well as traditional. High quality production here from British publisher J Allen.